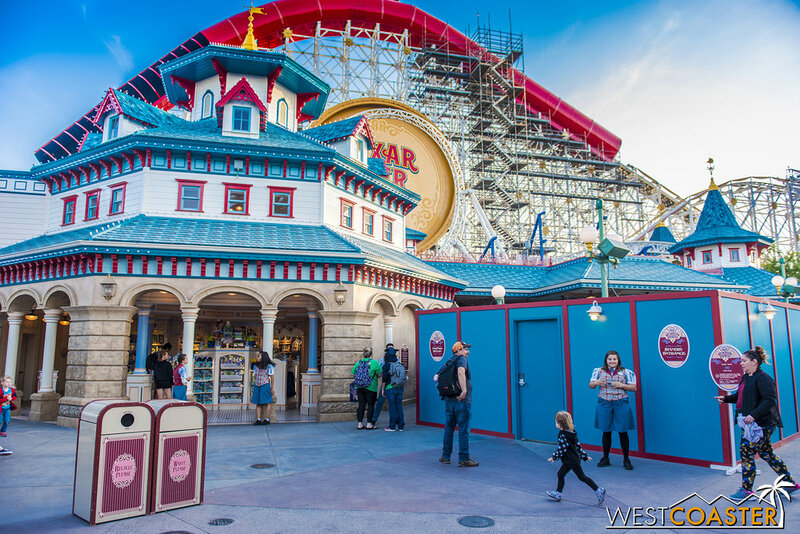 OK, well, maybe not anymore, but we're closing out the week with a report from the Disneyland Resort, where we haven't quite been the past few weeks as other things like Knott's HangTime have occupied our attention. 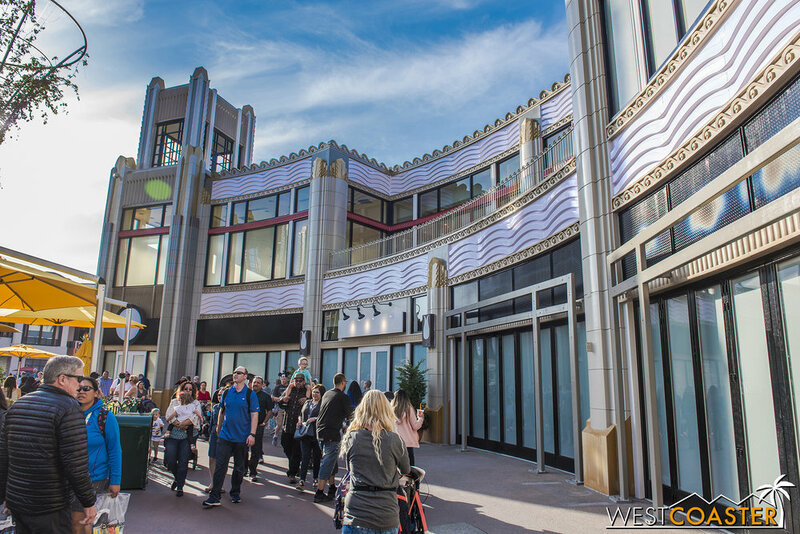 Today, we take our usual run through things that are going on around the parks and Downtown Disney and check out what is being worked on and what's not quite working. The summer season kicks off this holiday weekend, so lets check out what you can expect from Disney this summer! If you were expecting Star Wars this summer, well, your only satisfaction will be this weekend's release of Solo. Star Wars: Galaxy's Edge is still a year away--a blatantly obvious fact that Disney officially announced earlier this week with an opening date announcement trailer that provided neither a date nor any actual breaking information, except a formal gauge on exactly how far behind Walt Disney World's "Star Wars" Land is behind ours. If you missed it, Batuu, CA, will open summer of next year (which everyone pretty much expected), while Batuu, FL, will open "late fall" of next year. Thus, like an overanxious YouTube commenter, Anaheim, will get to call "First!" And Orlando will probably retort with something like "Best!" even though that word is not used in conjunction with Florida unless referring to bizarre crimes, drug addict weirdo stories, mysterious freak geological events, or wildlife crazy encounters. 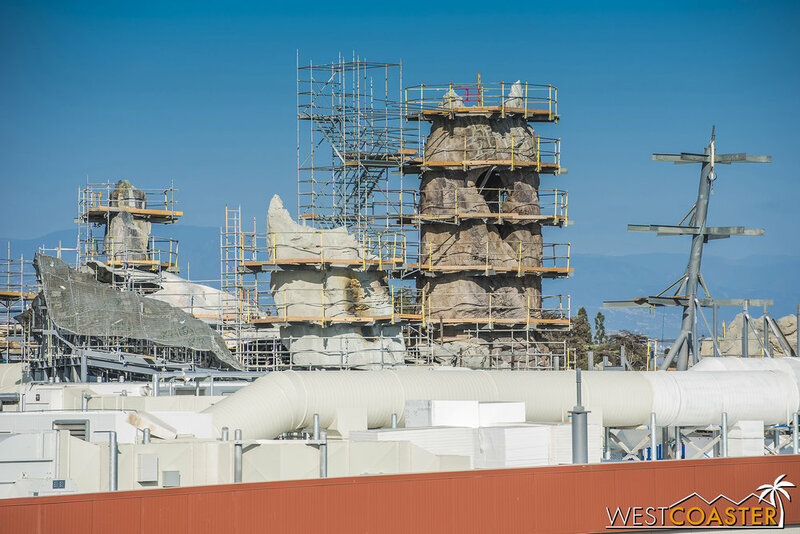 Anyway, Galaxy's Edge is pretty much more rocks and interior development that we can see. So we're going to zoom through this land in lightspeed today. Welcome to another look at a galaxy far far away. But not that far, because it’s coming to Anaheim next year. There’s still a good amount of work left to do. But we’re able to see less and less of the progress from these parts. As you can see, the building facades are largely done overall. It’s more rock construction these days. These guys are getting painted to look more realistic. As long as you ignore the gaping holes on their backsides. That’s right, I said “gaping holes in their backsides” for a photo full of phallic objects. But just look at that! You can see all up in that business. This is prime foamer fuel, non-GMO and all organic. 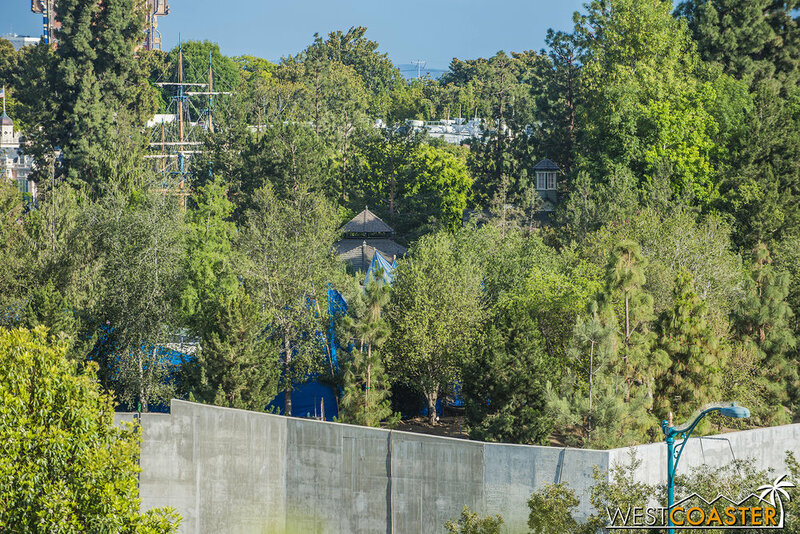 And sure, it’s not the side you see from “on stage,” and clearly, if you’re looking at “Star Wars” Land from this side, the building itself will ruin any illusion of an actual faraway land. Over in this corner, they’re planting more trees. And adding more steel for more rocks. I always think this looks like it’s going to be a giant AT-AT, though. There’s some roof behind the steel in white too. See? You can see a bit of mesh and stuff already. 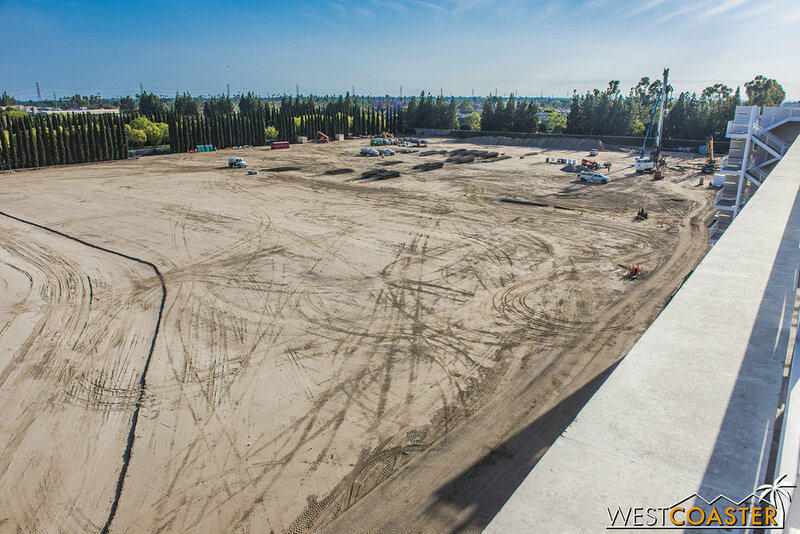 Nothing has gone vertical yet as of last Friday, but that will probably change soon, as rebar for foundations has arrived on site, and pile drivers are starting to create caissons for deep footings to support the new neighboring parking structure. The rest of the site has been further graded. Meanwhile, we got some fantastic name suggestions in the last update. Keep them coming, and you too can contribute to the evolution of the title of this segment of the update! 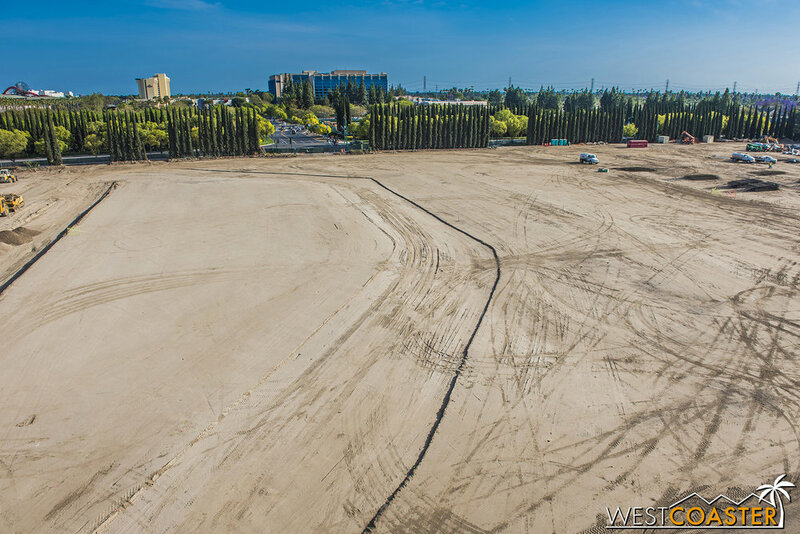 This week in parking structure news update… DIRT! Oh hey, two formwork pieces for foundations. They’ve really compacted the soil. Make your Tattooine jokes here while you can. Remember when we were saying that about “Star Wars” Land a year ago? Someone go wake Guy Selga. Noodles are back in the update!! This is a pile driver. It pounds the ground hard, creating a deep, dark hole that will eventually receive a rock hard shaft (caisson). There’s some electrical equipment that’s been saved over by this corner of Magic Way and Disneyland Drive. So this continues chugging along. Hope it can be finished before Galaxy’s Edge opens! 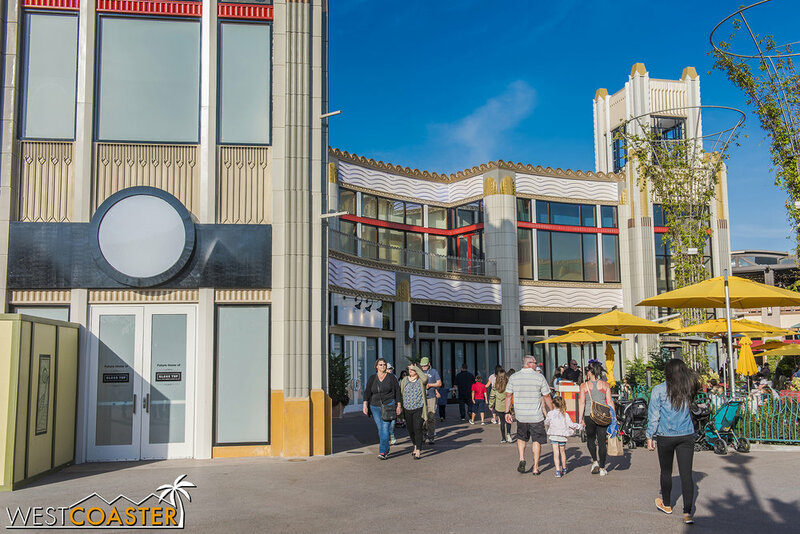 The paint job at the facades of the future Black Tap Craft Burgers and Ballast Point look pretty much done, though there's still work left at the interiors. 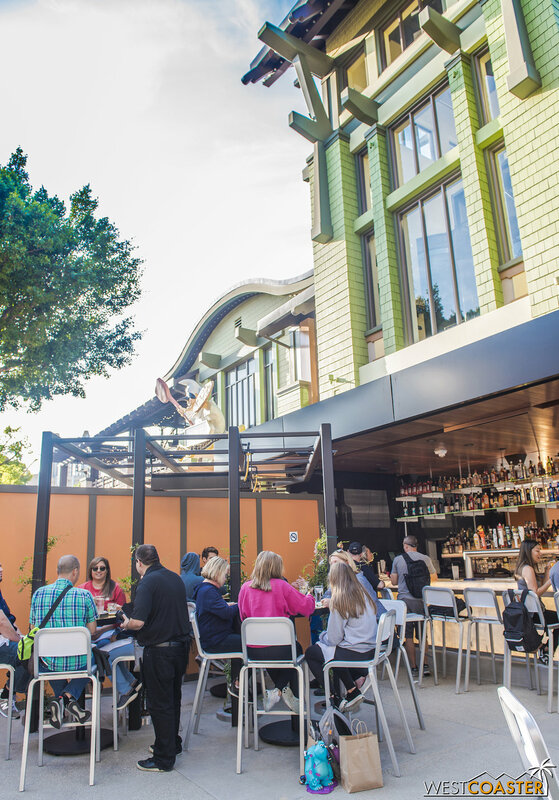 Meanwhile, last Friday, part of the new outdoor bar and seating expansion at Naples Ristorante opened! 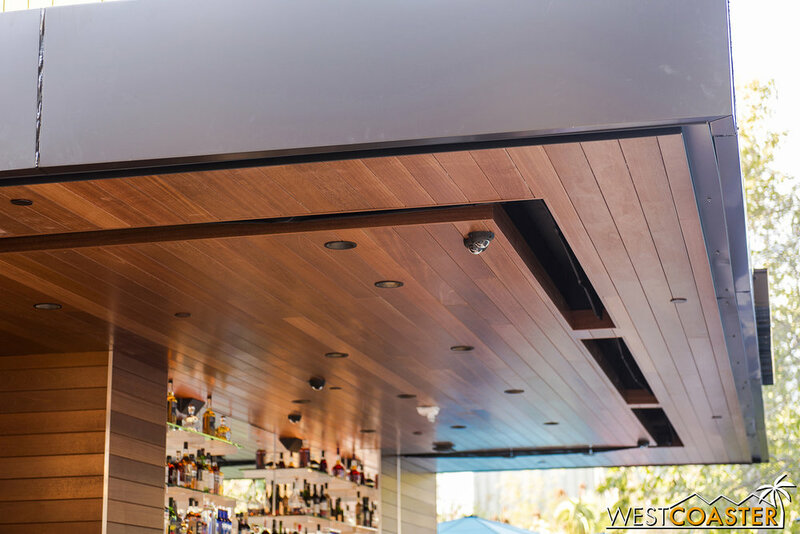 It's got a chic, modern style and looks like a very pleasant space to relax and have a weekend drink. Or a weekday drink. Really, whenever you're free, I suppose. There's still more work to be done to the entry canopy and the area around it, but Disney lushes now have another option to have a boozes! So while I wasn’t paying attention, Tortilla Jo’s got repainted. At least I’m like 91% sure. Not sure when or how they’re getting all these DtD facades painted without scaffolding present every time I stop by, though. Must be magic or pixie dust. Anyway, here’s what Black Tap looked like as of a week ago. I don’t mind this color scheme. It’s interesting and a nice blend of simple and accent colors. Ridemakerz graphics still visible inside Ballast Point. No more bears to build here. 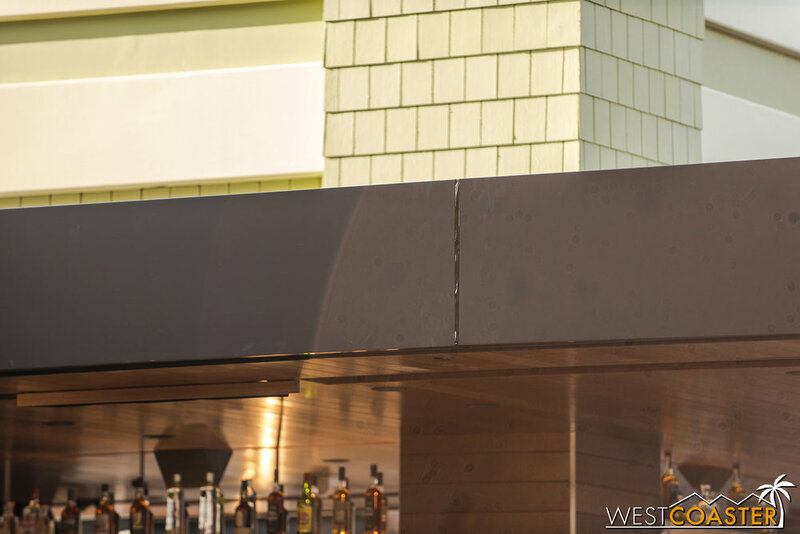 Meanwhile, the new entry canopy of the Naples Ristorante is getting finished. Literally. The aluminum panel is being installed in segments. And the siding is still torn up. But guess what? The bar has opened! Yes, Disney alcoholics have a new place to socialize. Hey, uh, might want to touch up that jointwork there. 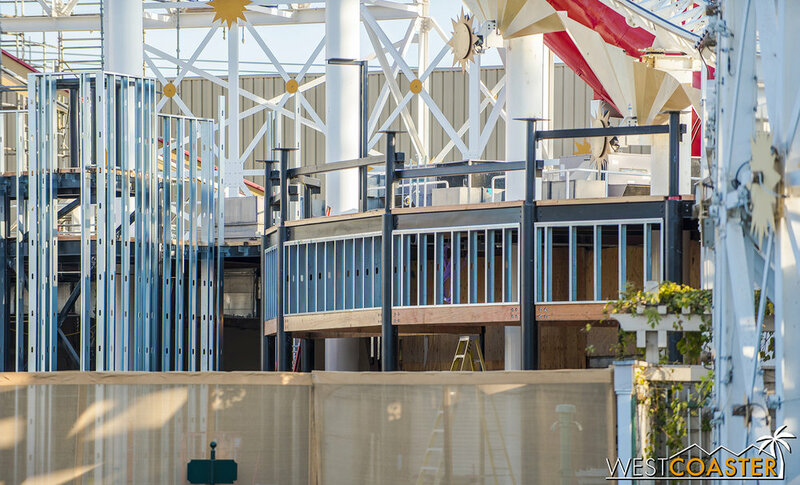 Work walls are still up around the unfinished canopy portion. But the bar side is finished! Well, mostly. There are some ceiling slot diffusers missing here to cover the gaps where the AC comes down. I like the turquoise canopies. And the hanging light fixtures are pretty groovy and stylish. Where to drink and pretend you’re Italian. There were plenty of guests on the first day of operation already. The trellis structure with heat lamps will be nice on colder nights. 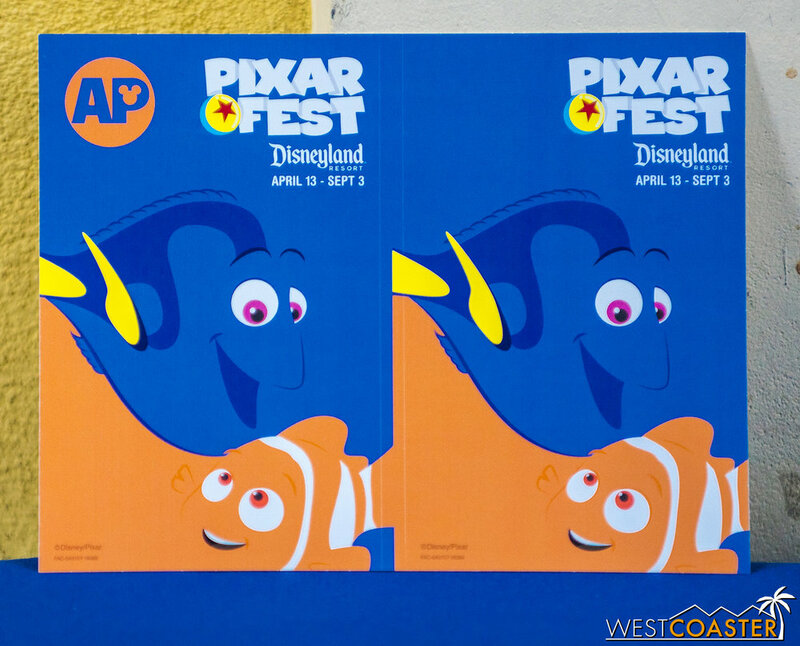 There are new vinyl decals at the AP Corner for Pixar Fest, and new Little Green Men popcorn buckets went on sale, much to the enthusiasm of annual passholders who just had to have them. To be fair, a lot of the Pixar Fest and related merch that's come out has been pretty adorable or ridiculous yet must-have, like that Thanos Infinity Gauntlet Souvenir Sipper. 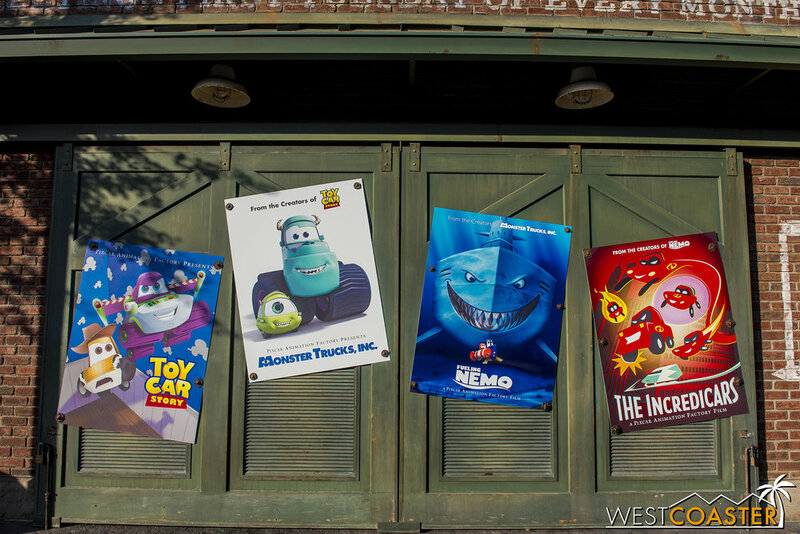 I never grabbed a photo of these punny signs in Cars Land that are part of the Pixar Fest overlays. New decals last week for Pixar Fest. If you were like these folks last Friday, you were waiting to get a souvenir popcorn bucket. Not gonna lie… that’s pretty cute. Open wide and receive popcorn. It’s like they’re Jenny O or something! 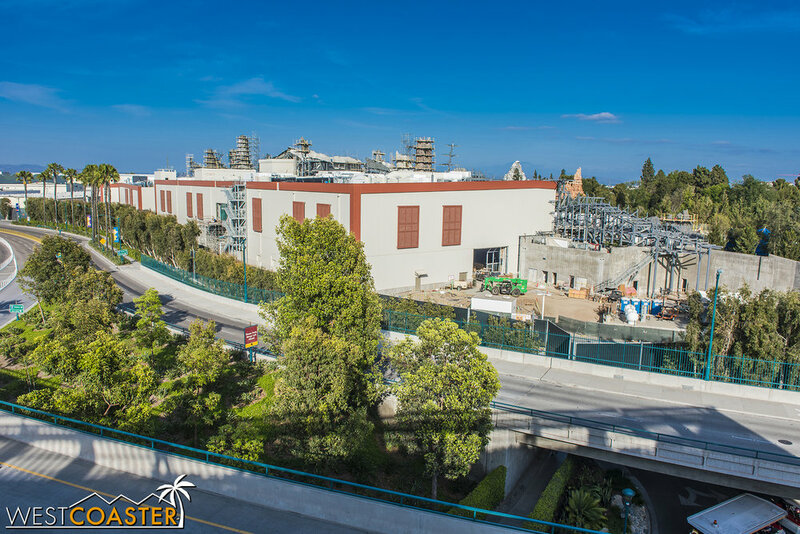 Finally, Pixar Pier continues to progress, with a lot of scaffolding around the Incredicoaster, Mickey's No Longer Fun Wheel Because Pixar Pals A-Round, and Toy Story Midway Mania facade. The new roller coaster continues testing, and a lighting package was even recently seen cycling through at night (it apparently did not have its OCD Mode turned on). 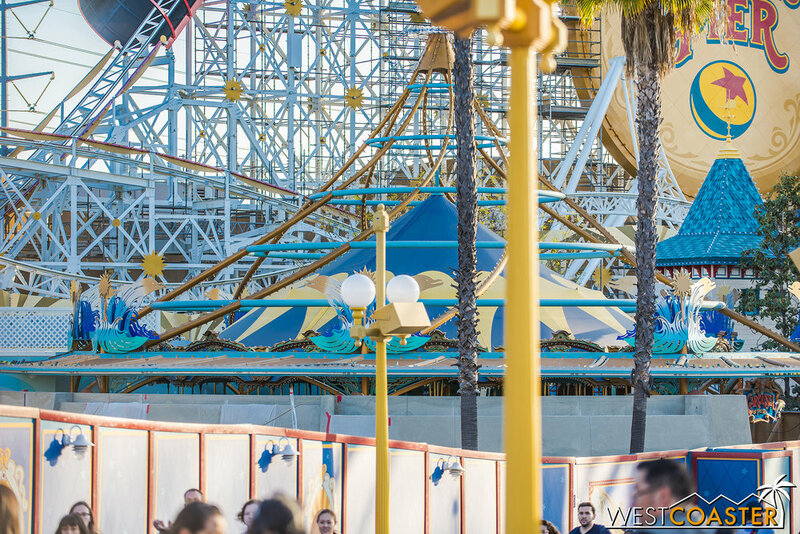 As much as I dislike the ill-conceived attempt at inter-brand synergy that is the Pixar Pier project, I must admit that a lot of the unveiled areas look pretty nice (even if the overall theme lacks cohesiveness due to the "four neighborhoods" approach. Lets talk about what's not quite happening, though. 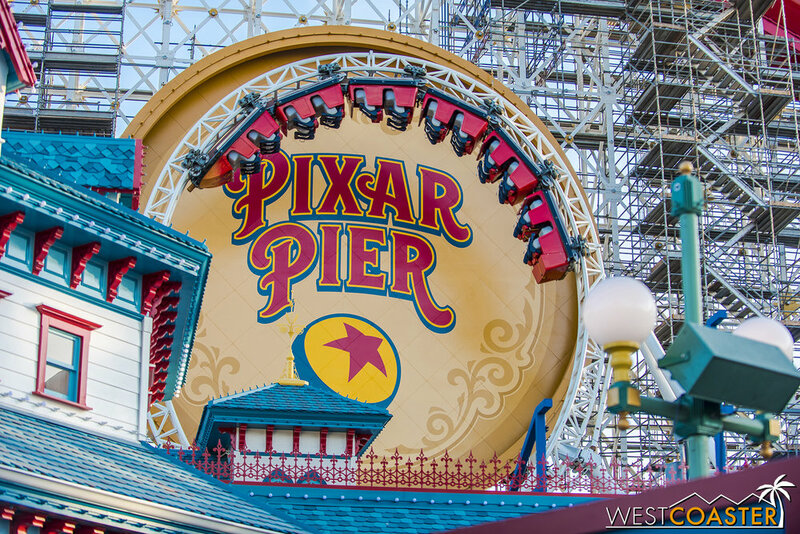 When it officially opens on June 23, Pixar Pier will be without two of its advertised attractions. The long-promised Inside Out attraction on the site of the old Maliboomer hasn't even begun construction, but it was always promised to open "at a future date," so this was expected. What was probably less expected was the opening date of Jessie's Critter Carousel, which Disney recently confirmed won't open until 2019. I suppose the signs were there when it was just a couple of months ago, and work hadn't begun at all over there. 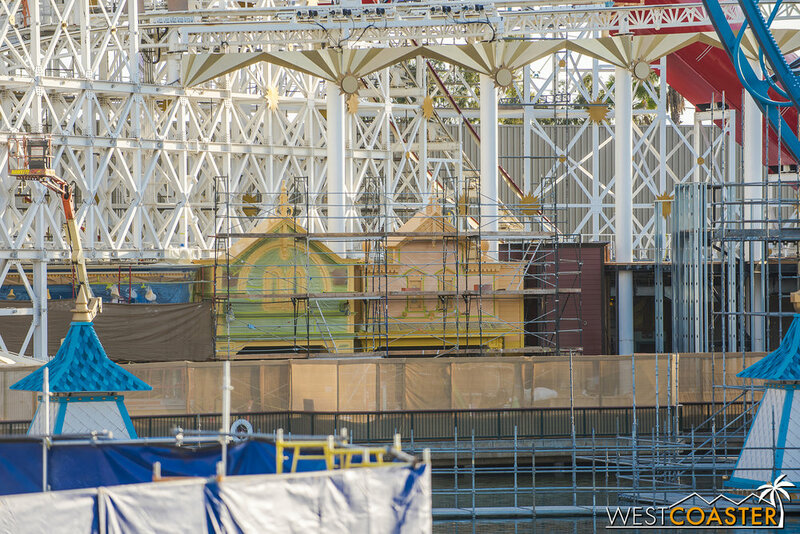 That particular ride transformation has been going very slowly, with not even the canopy removed or any sign of the actual carousel being touched much yet. So... I guess it can compete with "Star Wars" Land next year? 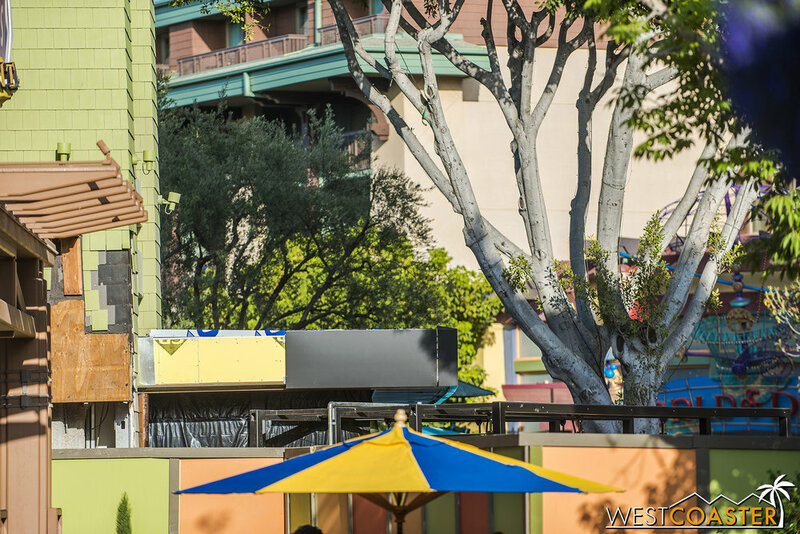 Also not returning as originally expected, World of Color, whose middle platform kind of committed seppuku earlier this week and doesn't look in the kind of shape that will allow the popular nighttime show to return next month as originally scheduled. I'll grab a clearer photo next time I'm by the park, but if you were to see how it looks like right now, you would not be optimistic about WoC doing much of anything anytime soon... Call it Pixar Pier Synergy Karma? "The gods have been angered by all this Pixar making..."
Where what has been worked on so far looks nice but doesn’t necessarily cohesively fit together. 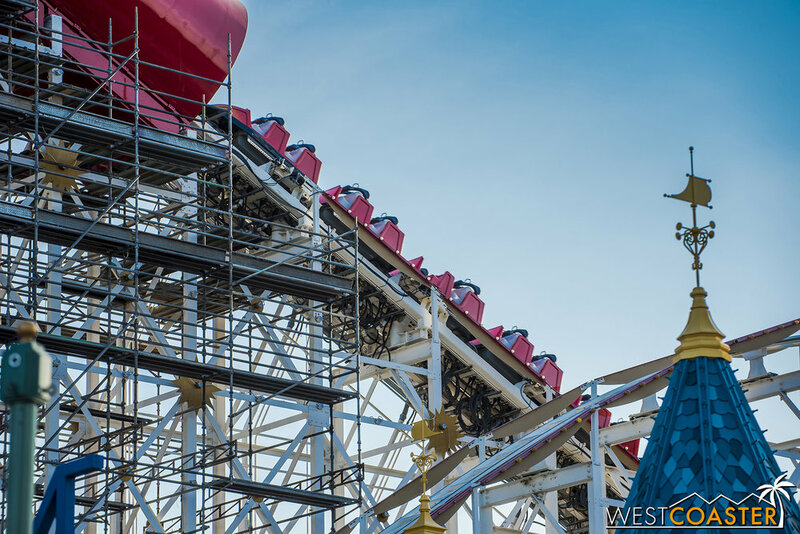 Scaffolding is coming down across the Incredicoaster. And it’s almost completely come down at Mickey’s Fun Wheel Cuz That’s Its Name Not That Pixar Pal-A-Round Cockamamy. Well, at least it got a new paint job. Hopefully, the replaced the burned out light bulbs too. Speaking of new paint job, the red / turquoise Paradise / Pixar Pier color swap continues with the World of Color projection shelters. Just one left to be painted. He’s the rebel one. 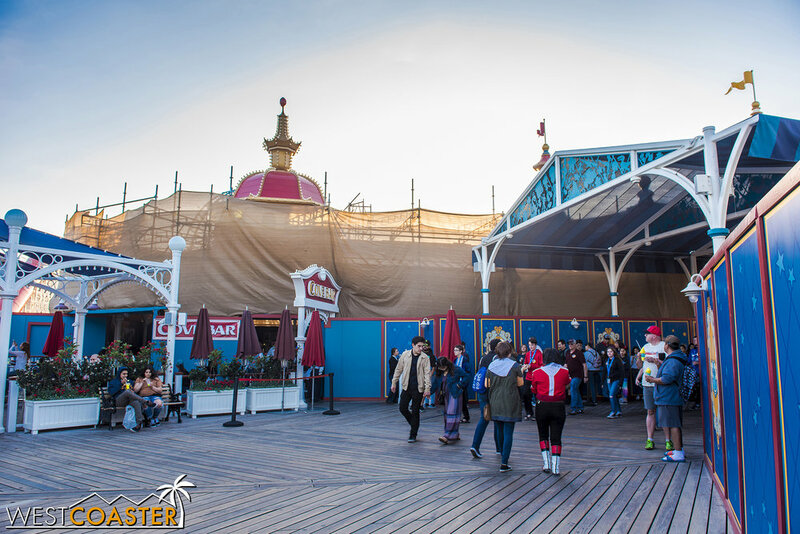 They’re also continuing to work on the facade for the Pixar Pier boardwalk games area. Although construction workers can finish things pretty quickly when required, it seems like it will be a scramble to get the exterior sheathing, waterproofing, wall finish, and roofing all done, plus the impacted interiors. 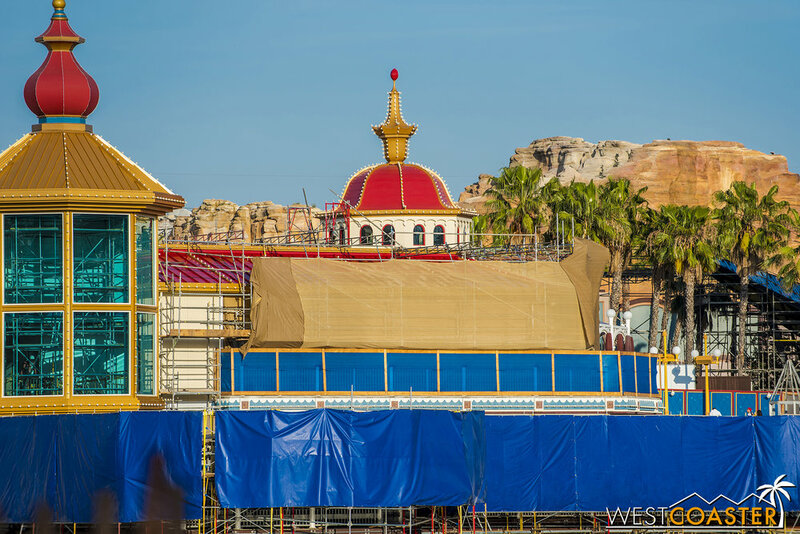 In fact, with a June 23rd opening, I would have expected this area to have been sheathed by now at least. ideally with wall finishes done too. After all, they can’t finish the inside until they finish the outside! At least the other facades are largely touch-up. They’ll be racing along the whole area, though, I presume! The back of the Pixar Phun Wheel. The entry marquee has been remodeled. The new scream tubes have been fully installed. Lighting bands stretch across them too. You can see the white arcs that wrap the tubes. Here’s the top of the mid-course lift hill. The light band spacing gets unequal at the apex. I guess Disney is looking to compete with Knott’s on best roller coaster nighttime lighting package. Too bad the rest of the track and structure weren’t repainted. Even though they did repaint part of the track. Here’s a shot of the new LSM launch. It looks just like a LIM launch… mainly because the effective difference between the two lies in the train, not the track. Screamin’ was testing last Friday. Excuse me, I meant the Incredicoaster. The ride will chase Jack Jack as he uses his haywire superpowers to get giant cookies, or something. Or maybe they are following him around as he plays carnival games. Iono. 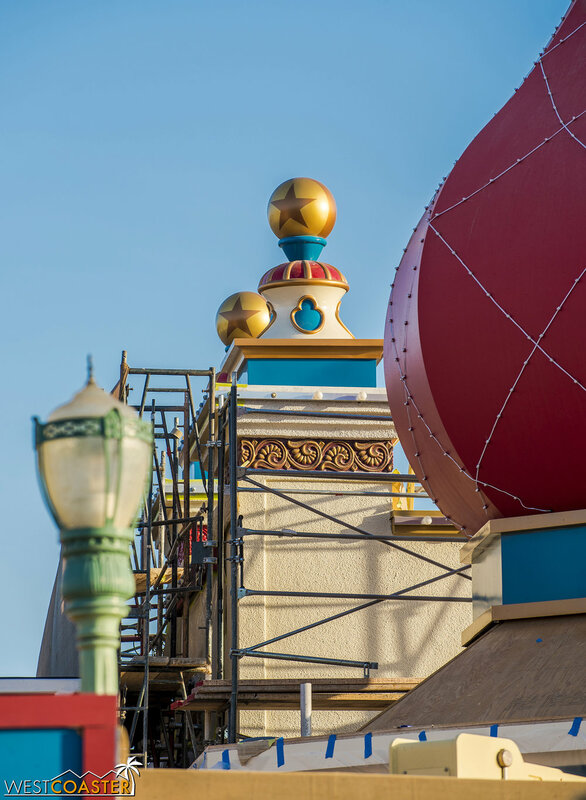 Lamplight Lounge continues to come along. Some more scaffolding has come down after repainting here. They’re working on the bay side and the lower level of the restaurant. Rebuilding a new shade canopy over the outdoor dining at the waterfront. The details atop the building are cute. Fun little bits of ornamentation. The new canopy over the main walkway has been given a series of silhouettes of various Pixar characters. These are some great details. Touches like this make me more amenable to the whole Pixar Pier idea. If only the entire land carried the same aesthetic. This is almost a Disnerd’s Easter egg trove on these grills. The inside of Cove Bar is now blocked off while crews work on the lower level, to mitigate construction dust. From the Cove Bar entrance. 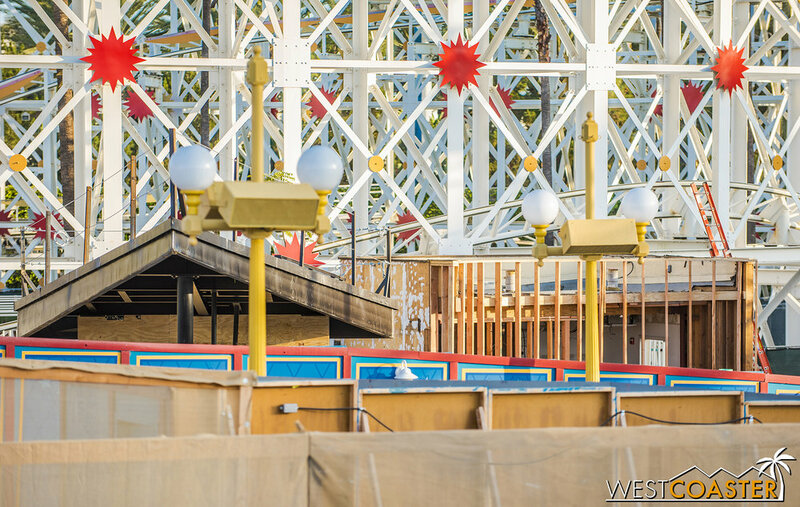 The removal of the high scrim walls along the turn over the Incredicoaster launch has provided new angles to photograph. 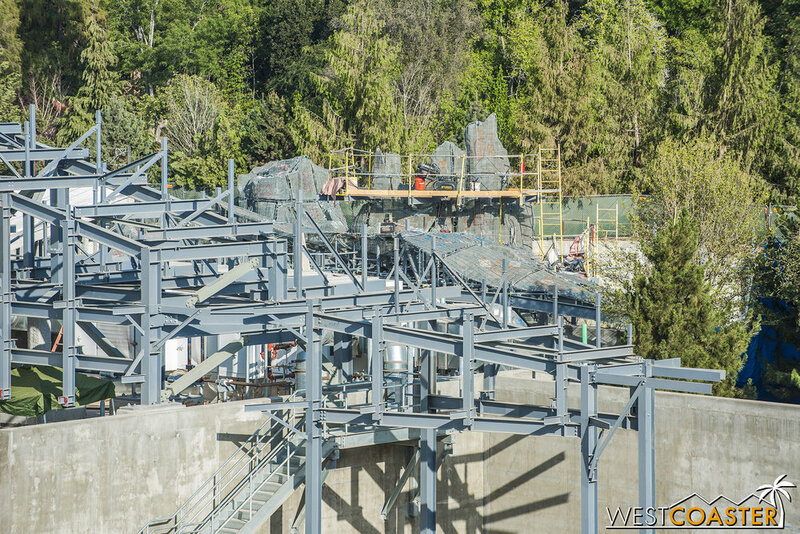 Work on the lower level from the coaster side. 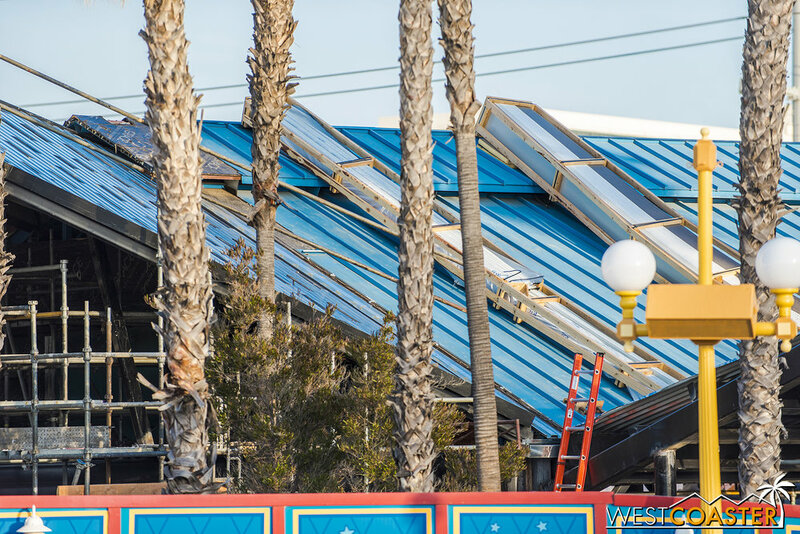 Speaking of coaster, the standing seam metal roofing is getting installed over the extension made for the Incredicoaster’s remodeled station. The design of the station honestly looks great. I love midcentury modern aesthetic. It’s just that a 1950s look sandwiched in between a classic, Victorian style seaside pleasure garden aesthetic doesn’t actually match. 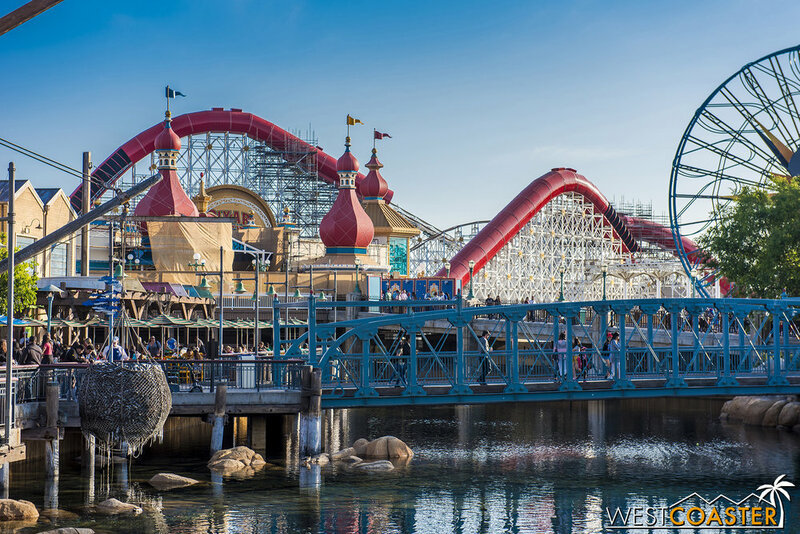 So while this looks nice, it goes against the Disney claim that Pixar Pier seeks to continue a thematic cohesion throughout the reimagining of the area. 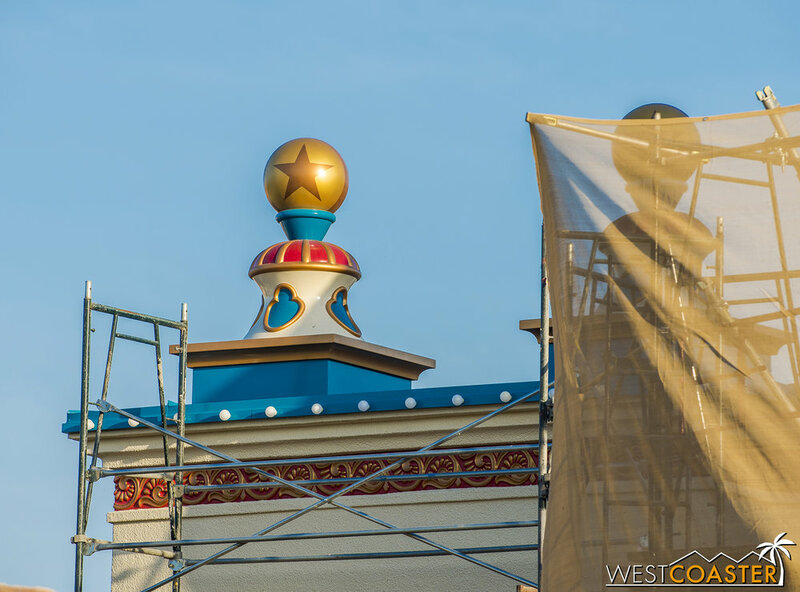 Some of the roofing has already been repainted. The red does look bold and snappy. 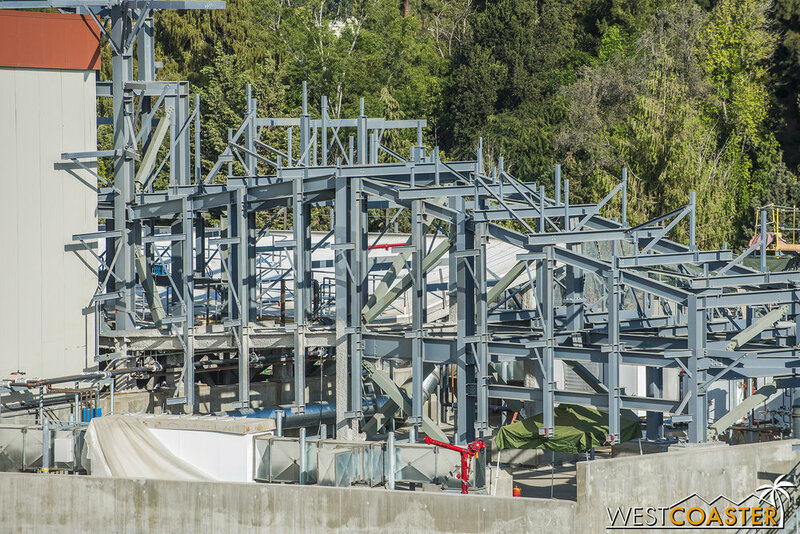 They’ve also put up the angular canopy that marks the entrance to the Incredicoaster queue. it’s got a similar midcentury modern aesthetic… sleek and sharp mono-sloping roofline and such. Soon, this will be red, not blue. 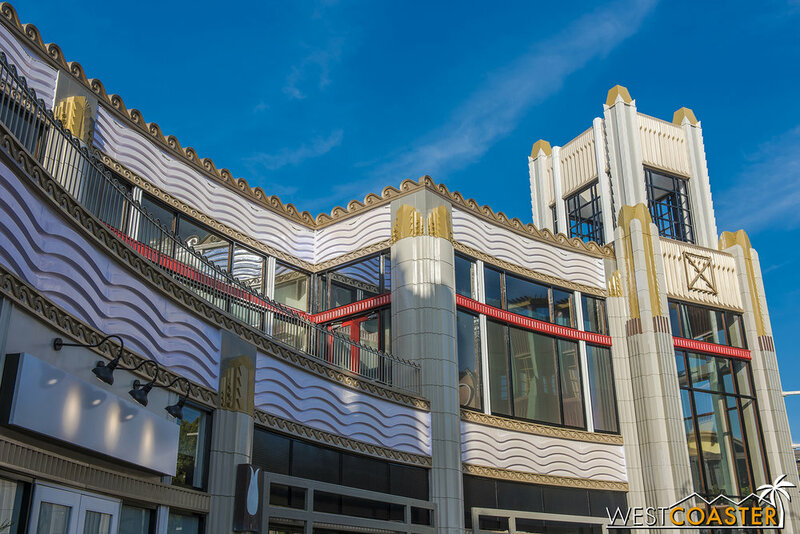 To muddy the aesthetic further, in addition to Victorian and midcentury modern, there’s also what can best be described as postmodern kitsch. 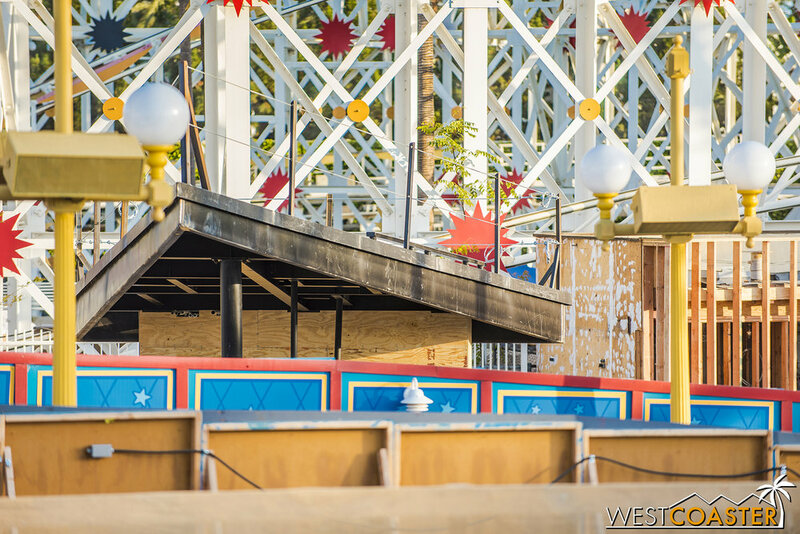 Meanwhile, the concrete wall that surrounds Jessie’s Critter Carousel (why was this not the “Pal-A-Round? ?”) has been finished. Coming soon, a waterfall wall, even though the aquatic theme is being removed. Oh, and also, it turns out this won’t be ready by June 23rd. Obviously, not if it’s at this state now, still. But how about we have to wait till 2019 before this is done! A whole year! The entrance to Toy Story Midway Mania has been relocated to the back end. The main queue and Mr. Potato Head are being refurbished. 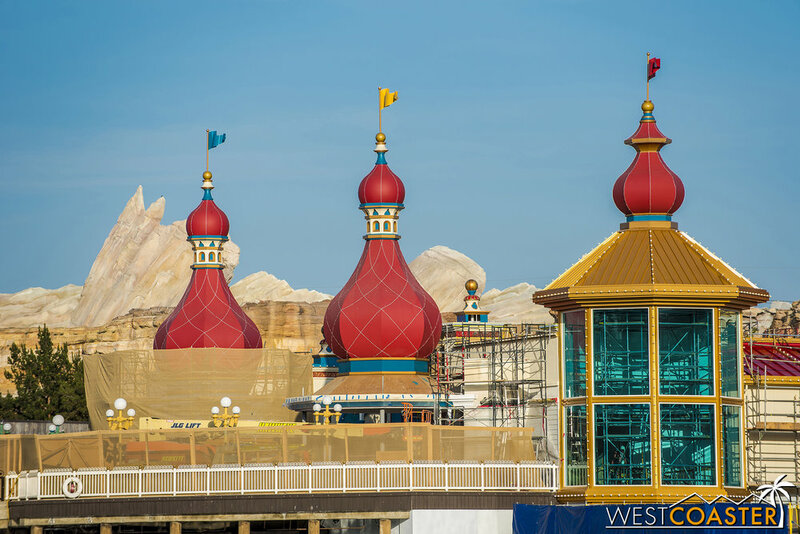 Lets take some close-up looks at the Midway Mania facades that have been uncovered now. I think these look very nice. The Midway Mania sign has disappeared. Perhaps stolen by Little Green Men. They should have replaced this with a tacky temporary tarp, just like over at Redd Rockett’s Pizza Port / Alien Pizza Planet. The souvenir store roof from the other side. I dig it. I’d be okay if Pixar Pier had transformed everything to this aesthetic. You can mix an IP with theme park immersion if it’s done right. Just look at how Toy Story Trolley Park is integrated into the New York-themed American Waterfront area over at Tokyo Disney Sea. Also, I mentioned last time that Adorable Snowman Frosted Treats opened earlier this month. Here’s the menu. Have some yellow snow… cone. It’s been VERY popular, though. June 23. That’s when this all… er… mostly gets done. And if you feel like shelling out $300, you can attend a private preview party the night before! Even though it won’t be complete! Capitalism!! And that is pretty much that. Enjoy a great Memorial Day weekend. Have some BBQ. Hang out with friends. Go to the beach. And remember our nation's troops who have died protecting the country and our right to all the great things we enjoy... like being snarky and complainy on the interwebz. Seriously, we do owe them a great debt for preserving our country's freedoms.